This "top of the line" janitor cart is much quieter to push around than those heavy metal units. The cart is gray in color, and comes with a strong vinyl yellow bag, which can be used for trash or laundry. Not many other janitor or cleaning carts come with the rugged durability that this cart is known for. The economical price and rugged durability make it the best bang for your buck we have to offer. Take a look at our complete line of janitorial & other cleaning carts for more options. The three shelves can be utilized to carry cleaning chemicals and supplies, while the front area can store a vacuum or mop bucket. All in all this 3 shelf janitor cart will cut your cleaning labor down, just by keeping your tools and supplies close at hand! Perfect for small or large janitorial/cleaning accounts. Two organizing shelves for all your janitor supplies. Smooth, easy to clean surfaces make maintaining you cart a breeze. 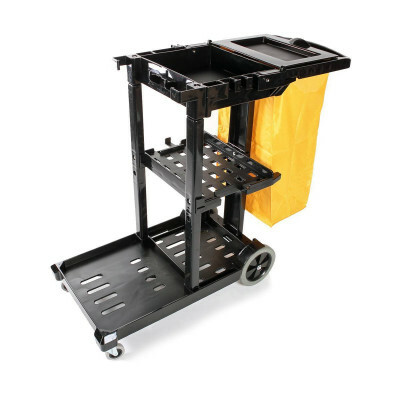 Easy to assemble janitor cart will have you cleaning within minutes of removing it from the box. Compact size (44 1/2" L x 18 1/4" W x 38" H), makes it the perfect fit for any job. Customers who were interested in the O-Cedar 3 Shelf Janitor Cleaning Cart - Black were also interested in the following items. This is a review for the O-Cedar 3 Shelf Janitor Cleaning Cart - Black.